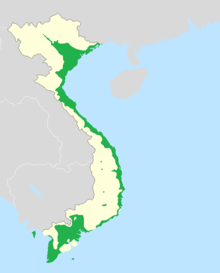 Vietnamese (Tiếng Việt) is the official language of Vietnam. Like many languages from Asia the Vietnamese language is a tonal language. It has been strongly changed by Chinese languages. The Vietnamese language has shared history with other languages such as Khmer. Today, it uses a Latin alphabet based on the French alphabet. The Vietnamese alphabet was once based on Chinese characters. It is called Chữ Nôm. Fewer people know Chữ Nôm today. Most Chinese speakers who live in Vietnam now use regular Chinese script for calligraphy. Some traditional calligraphy artists can still be found. For example, Ho Chi Minh City has a district famous for its popular Chinatown. In modern times Vietnamese adds new words that are needed. With more engineering, science, and academics many words are taken from these professions. Also there has been an increase in media use. Some social words taken from media are now accepted as common. The spoken language of Vietnam changes between each province. The greater the distance between provinces the stronger the difference. The difference between Hanoian and the Mekong is called a dialect difference. Nowadays, the national education for all of Vietnam includes the Hanoian dialect. However, each ethnic tribe may still use a different dialect, language, or vocabulary. There are speaking programs that use the Vietnamese language. A computer add-on for the Firefox web browser can read text with the 'vietnamization' that is needed. It's called Vietnamese TTS (Text to Speech). Audio libraries are available to reproduce the Vietnamese language. Google translate uses a TTS reader and sound library to read Vietnamese in simple sentences. Portable electronic translators are also very popular. Kim Tu Dien makes the most common portable dictionary for the Vietnamese market. The Vietnamese alphabet (In Vietnamese: "Chữ Quốc ngữ", means "The National Scripts"). The combination of two vowels makes a diphthong. The dipthongs used in the Vietnamese language have some rules when used. For example, one rule states where the singular tone for both letters must be placed. There are more triphthongs in Vietnamese than English. 'uye' is included. The syllables refers to the Chinese use of two characters as syllables. So, Hong is one and Kong the other. Vietnamese also uses one syllable as a word. In the same way as English, people can say just 'go'. For more emphasis (in Vietnamese) it could be said twice. The use of the syllable twice is from the history of languages for Asia. Some Australian Aboriginal languages are known do the same thing. So, 'go - go' (Vietnamese: đi đi) means "go now", in a higher strength. But also, 'go' is enough in Vietnamese. Many single syllables are used by the Vietnamese language. They can form sentences without pairing with other syllables as they do in Chinese. Readers (and speakers) still notice that many syllables, in most sentences, are paired. Many words from around the world were needed in Vietnamese. Sushi is a common word used by most languages. When a word is vietnamized, it is changed to sound Vietnamese. China uses the same idea: Ao-da-li-ya in Pinyin means Australia. The first rule for vietnamization is that 'no Vietnamese word/syllable is broken by a consonant'. E.g. (Việt Nam). An example of how to break a foreign word into two syllables is mô tô which is used for motorbike. It's not the most common word for motorbike, but it is accepted. This word is a vietnamized version of 'motor' and 'auto'(ô tô). However, the rule is not always right, e.g. lôgic. When introducing a common foreign word, people 'vietnamize' the word in at least one spoken demonstration for Vietnamese listeners. This rule should explain a problem with the foreign use of the family name "Nguyen". It is not New Yen! Y is not a consonant in Vietnam. A better explanation is by comparing the English name Ian to any name with Yen( e.g. Yến). This use of Y has an equal in English: many, penny, etc. use the vowel 'y'. The second (softer) rule for vietnamization is that the sound of each syllable must be made 'a little closer to Viet sounds'. The second rule is made to work by adding the tone marks for vowel letters. For example: lôgic is an alteration of 'logic'. It would be needed to teach a couple of school and science subjects. Computer science uses this word. Any word can be made an exception to vietnamization. Names like Barack Obama, or Bill Clinton might be attempted by all Vietnamese speakers. In writing, these foreign names will mostly stay together (intact). Names like David are easy for Vietnamese people to say, and have become very popular in English-class writing. Exclamations words are very popular in Vietnamese. People can use exclamations as an introduction to more things to be said. Or people can pass a comment (after saying something) with a quick exclamation. The exclamation word may express a feeling or just be an expression. Conjunctions are used in Vietnamese. ↑ Hammarström, Harald; Forkel, Robert; Haspelmath, Martin, eds. (2017). "Vietnamese". Glottolog 3.0. Jena, Germany: Max Planck Institute for the Science of Human History. ↑ 5.0 5.1 5.2 5.3 "Vietnamese Chu Nom script". www.omniglot.com. This page was last changed on 30 March 2019, at 16:50.